Noida: Graduands from over 23 Institutions came from different parts of the country, accompanied by their family members and received their much awaited Degrees and Diplomas, beaming with joy and exultation as they re- united with their Alma matter. 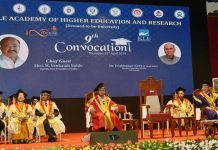 Accepting the Honorary Doctorate Degree, Shri Deepak Bagla- Managing Director & CEO, Invest India congratulated the graduands and stressed that they are blessed to be graduating at an opportune time when India is moving ahead at a rapid pace and is witnessing unprecedented transformation. Giving a glimpse of new India, he stated that by 2025, India would be largest human capital on the planet and by 2070, it will be youngest Nation of the world with purchasing power escalating to 18-19 trillion dollars in next 7-8 years. He remarked that India has been the top global FDI destination for past 3 years and has been the highest recipient of Foreign Investment, 50 % of which is green field investment. Further sharing important figures which corroborate the rapidly growing economy of India, he stated that India is the top Aviation market across the world, which is the indicator of economic growth of the country. He remarked that India has been moving fastest on the Global Competitive Index from 70s to 40s in 2017 and it adds a new billionaire in every 31 days. Advising the graduands, he called upon them to imbibe “steely determination”, “passion” and “perseverance” in order to make the most of the favorable times, since the baton has been handed over to them and the future of India rests on their shoulders. Accepting the Honorary Professorship, Mr. John Hughes- President, Royal Institute of Chartered Surveyors expressed his honor in accepting the Professorship and stated that the partnership between Amity and Royal Institute of Chartered Surveyors will enhance the education scenario in India and will lead to a bright future for everyone. He re-inforced that the partnership between the two institutions remains key element of RICS growth strategy in India. 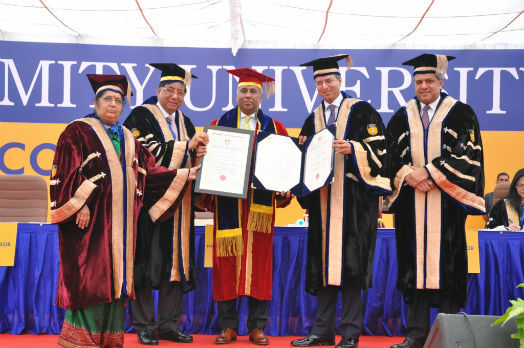 Congratulating the graduands, Dr. Ashok K Chauhan- Founder President, Amity Group stated that Amity graduands are unique since they have been nurtured with Behavioral Science, values, ethics and communication skills which make them distinguished achievers and real might and force for the nation. Dr. Chauhan shared with them the mantra of success which he lucidly explained through the acronym BHAAG where B stands for Behavioral Science, H stands for Hardwork with Strategy, A for Attitude, another A for Ambition and G for God. He called upon the graduands to learn the mantra of BHAAG by heart and implement in their lives through which they will be able to convert all the adversities into opportunities. Addressing the gathering, Mr. Sean Tompkins-Chief Executive Officer (CEO), Royal Institute of Chartered Surveyors (RICS) expressed his delight on attending the third Convocation of RICS School of Built Environment, Amity University which started with a humble strength of 170 students and currently has more than 1100 students. He shared that over 96% of the graduands of School of Built Environment went straight into the industry. He outlined the expansion plans of RICS with Amity University in near future and announced that in 2019, RICS is bringing World Built Environment Summit to India where the partnership between both the Institutions will play significant role. He shared that by 2024, India’s population will exceed China and will become 1.5 billion by 2030. India is projected to add 300 million new urban residents by 2050, which calls for a need to protect the environment at the same time, accommodating the needs of growing urban population. He remarked that skill deficit is the top challenges faced by India and RICS School of Built Environment, Amity University aims at capacity building in the area of built environment through world class professionals so that students can take up their role in the global world. He announced that next year on the 150th birthday of RICS, School of Built Environment will award overall excellence and will award 150 thousand rupees. Presenting a brief report about Amity University, Dr. (Mrs.) B Shukla- Vice Chancellor, Amity University stated that Amity is India’s leading global education group, established over two decades ago. She shared that Amity is ranked amongst the top Universities globally by QS University Rankings and Times Higher Education World University Rankings; it is Asia’s only not-for-profit University to get US Regional Accreditation. She highlighted that Amity faculty have developed over 1900 management case studies which are bought across 62 countries by 490 organizations including Harvard, Oxford, Boston, Cornell and others. She briefed audience about Amity’s Student Exchange Programmes, Study Abroad Programmes, 3 Continent Programmes, India Immersion Program various other initiatives which are aimed at making Amity students globally sought after professionals. During the day, 30 Best All Rounder Trophies, 84 Gold Medals, 80 Silver Medals, 48 Bronze Medals and 51 Baljit Shastri Trophies were awarded to the meritorious graduands. Nine students were awarded Corporate Awards- Priyanka Bhadana – MBA-International Business,Amity International Business School was conferred with Amity-Kamdhenu Excellence Award for Brightest Female Student; Har Kaur Rainu –MBA- International Business, Amity International Business School was conferred Amity – Idea Award for Excellence in International Finance; Rachit Mittal- MBA-Marketing & Sales, Amity Business School was awarded Reliant EDS Award for Best Marketing Student ;Akshansh Kawatra- MBA- Insurance and Planning, Amity School Of Insurance, Banking & Actuarial Science was awarded Max Life Outstanding student of the year and others.